I’m not wild about shopping, but shopping for book lovers is a different story. I hope you enjoy browsing this list as much as I enjoyed putting it together. 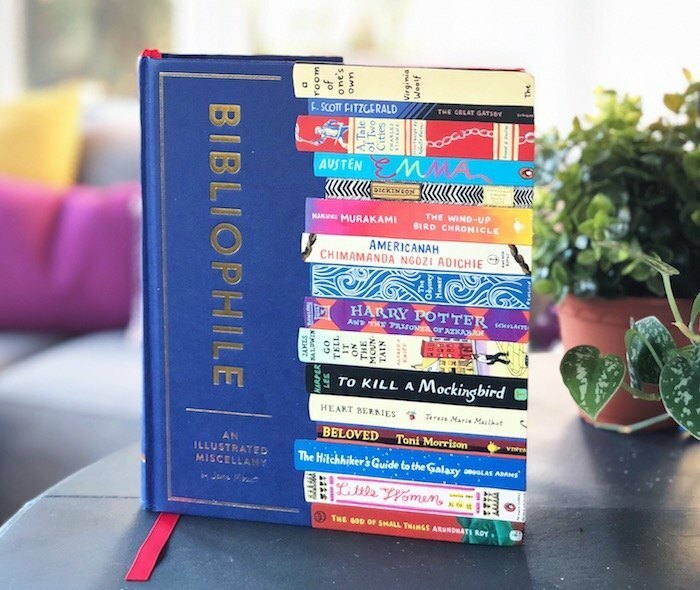 These 20 gifts are sure to delight the book lover in your life, but take note: I’ve chosen lots of independent shops and creators for this year’s guide, so watch those shipping deadlines and do them a favor by getting your orders in early! There’s no shame in your book nerd game! 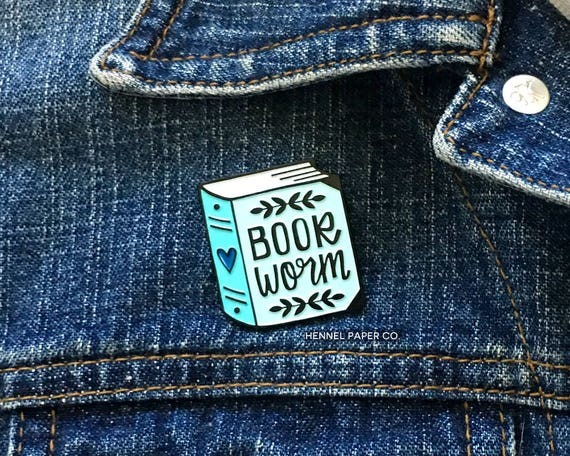 I especially love this bookworm pin from Hennel Paper Co. (plus they have a Plant Lady pin! ), but Etsy is full of bookish enamel pins to deck out your jean jackets, book bags, and bulletin boards. 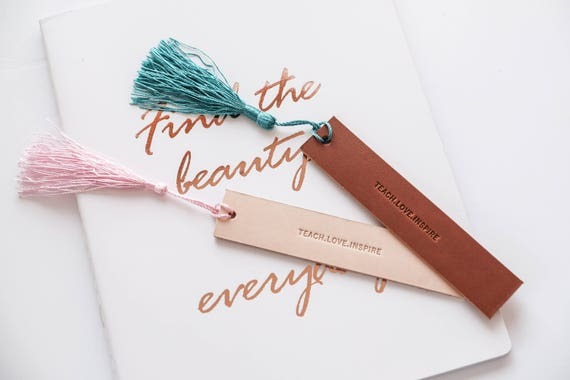 Personalize this beautiful bookmark with your reader’s name, initials, monogram, or a short quote, and they’ll think of you every time they open their book. 3. Books Are Magic tee. Whether you’ve visited the Brooklyn bookstore or only dream of doing so, this tee’s message is on point. I love my book sleeve, made by Kari Sweeney of @whatkarireads. Pretty and practical, it keeps your books from getting banged up in the depths of your purse or backpack. Order one for yourself or a friend by sending Kari a DM on instagram. 5. 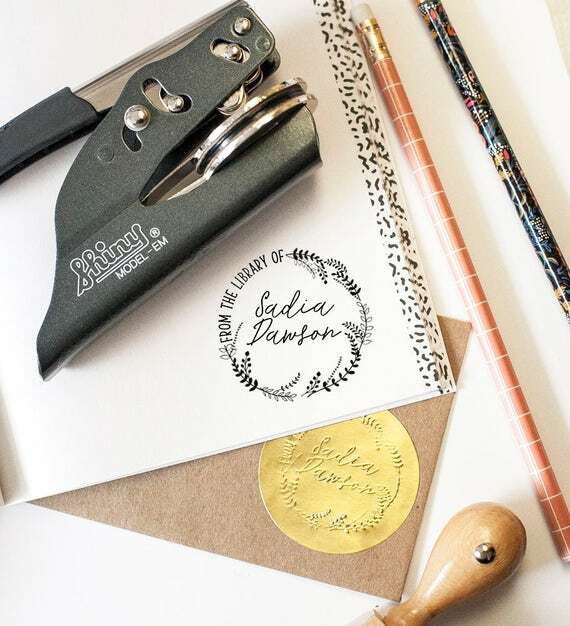 Custom book plate stamp or embosser. Afraid to gift a book to the reader who’s read everything? Give them this instead, so they can personalize their entire library. 6. 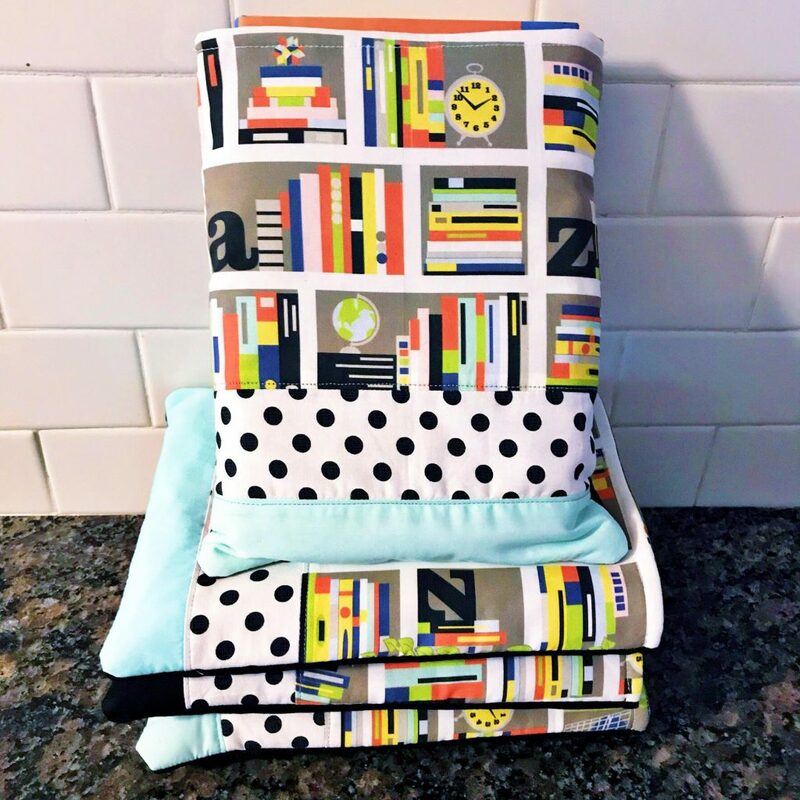 Page 1 cozy reader book bundle. 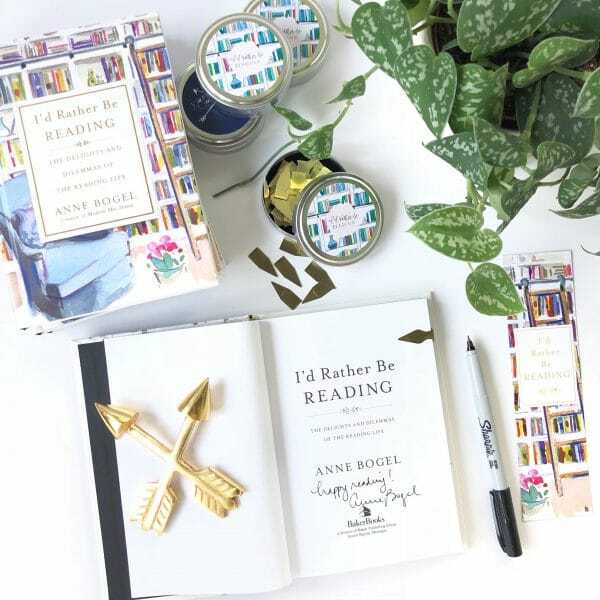 The delightful cozy reader book bundle has returned to Page 1 Books and this year you have the option to make your book I’d Rather Be Reading. 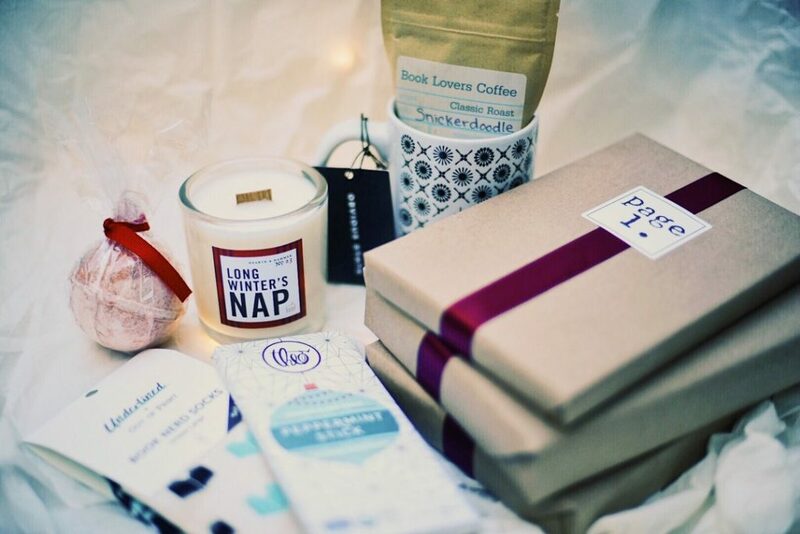 Each bundle also includes Theo’s Chocolate, book nerd socks, a bath bomb, a “long winter’s nap” candle, and a literary mug from Obvious State. So cozy! 7. I’d Rather Be Reading bundle. 8. 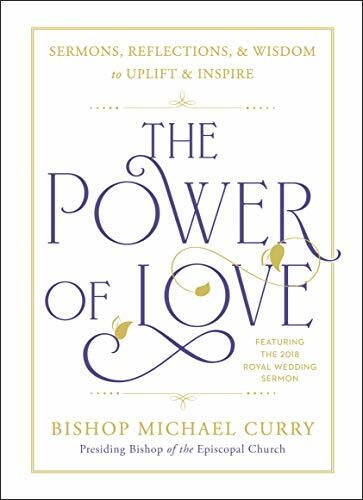 The Power of Love by Bishop Michael Curry. Remember the amazing homily from Meghan and Harry’s wedding? Now you can get it in book form, with an introduction plus additional sermons on love and social justice from Bishop Curry. 9. Hearth and Hammer literary candles. 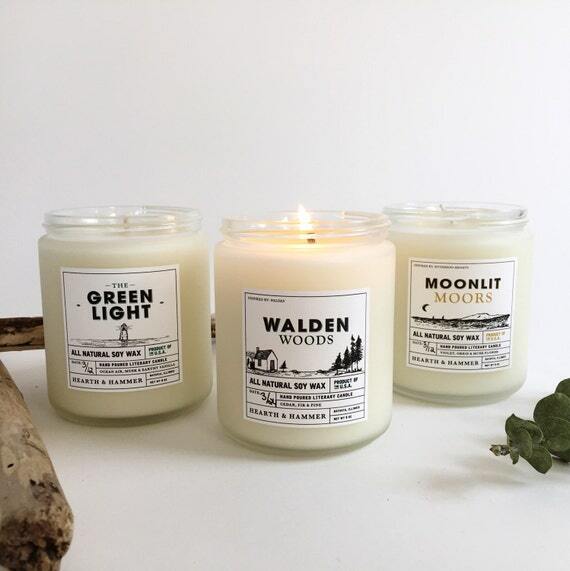 Hearth & Hammer is dedicated to “illuminating literature through aromatic storytelling.” Of their numerous sophisticated scents, my faves are Green Light, Walden Woods, and Burning Book. 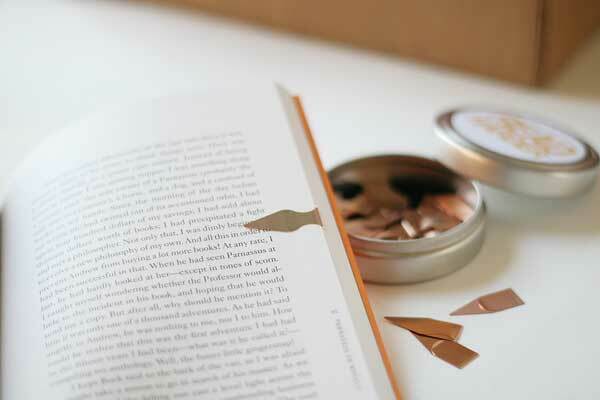 These magical little bookmarks mark not only your page, but the exact line you want to remember. Take it from a convert: once you try them you can’t go back to your old bookmarking ways. Available in Modern Mrs Darcy, What Should I Read Next, or I’d Rather Be Reading tins. This distinctive bookmark provides a classy way to read hands-free. 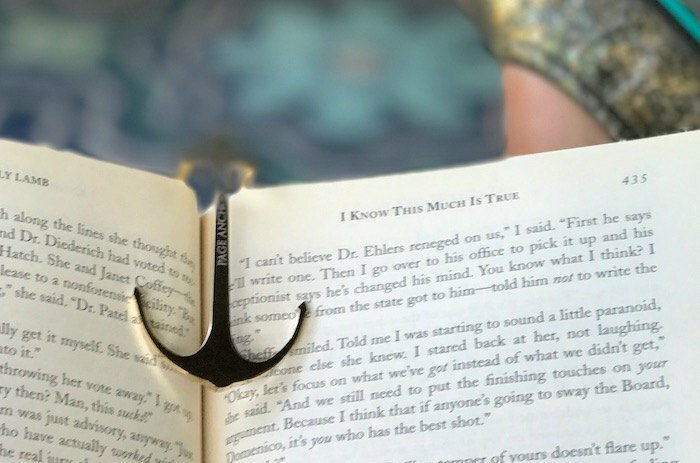 The anchor slides into your book and holds it open—without harming the spine—so you can enjoy your lunch and your book. Jane Mount’s illustrations make any bookshelf look ideal, but I’m especially fond of this “novels from the 1800s” mug. 13. Bibliophile by Jane Mount. A crowd-pleasing, practical gift for the readers in your life, especially those who generously lend from their personal libraries. 15. Easy, Tiger bookmarks set. 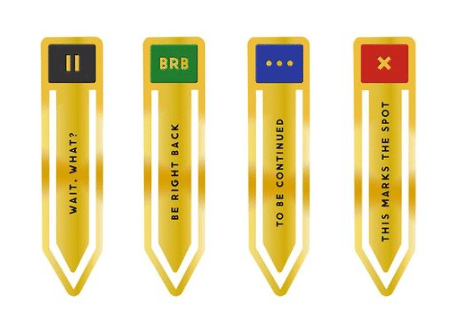 You can’t go wrong with snarky bookmarks, and this snappy set from Easy, Tiger is so fun. (I got mine at Franklin, Indiana’s Wild Geese Bookshop—stop in and see them or check out your local indie.) If you’d rather mark your place to taco bout it later, check out this foodie set. 16. Fond of books coffee mug. 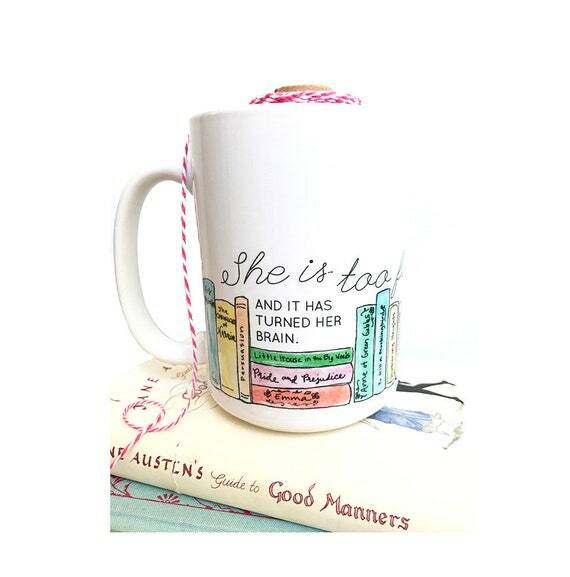 This adorable mug from fan favorite Carrot Top Paper Shop will delight the book lover in your life. If you’re looking for gifts featuring literary heroines like Anne Shirley, Jane Austen, and Nancy Drew you are really going to enjoy browsing. 17. 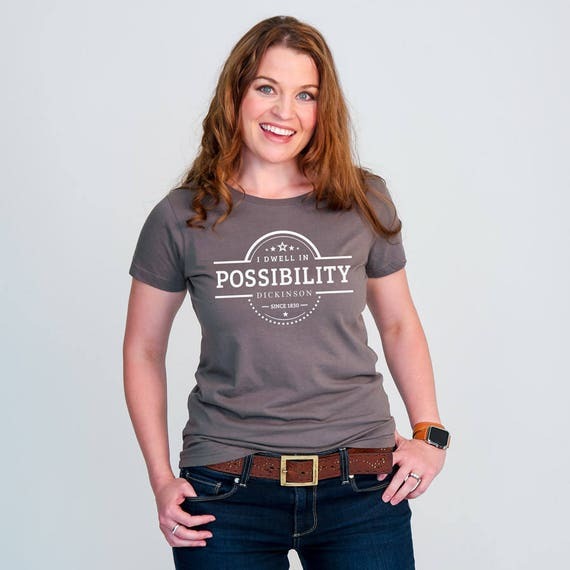 I dwell in possibility tee. Book Lovers Coffee offers beans for your book lover, your coffee lover, and especially your Potterhead coffee lover. Says CW Pencil Enterprise: “Baseball scoring is one of the few 21st century activities still done mostly in pencil, so we thought we’d make something specifically for it.” These pencils, sold in a set of six, are smudge-proof and dark enough to show clearly on glossy scorecards. Not a sports fan? This lefty sampler set would make the right person very, very happy. Don’t forget the sharpener. 20. On the write track tee. Modcloth regularly features a nice variety of book nerd options, including this graphic tee. Also of interest: this book dress, this hand-drawn books tee, these adorable book worm knee socks, and this fetching library skirt (that you all keep telling me to buy). P.S. Want more great bookish ideas? Check out the still-fresh 2017 guide right here with 30 more great gift ideas, and click here for the 2016 gift guide for book lovers. These are great ideas! I especially love the book sleeve! Our local paperback consignment store sells book bones – weighted bone shaped plastic things to hold open your book. They have changed my life! I love everything and want to gift it to…me!!!! Thanks for all your good works! Love your site!!! If you like the book sleeve idea, check out Sweet Sequels on Etsy (@sweetsequals on Instagram)! 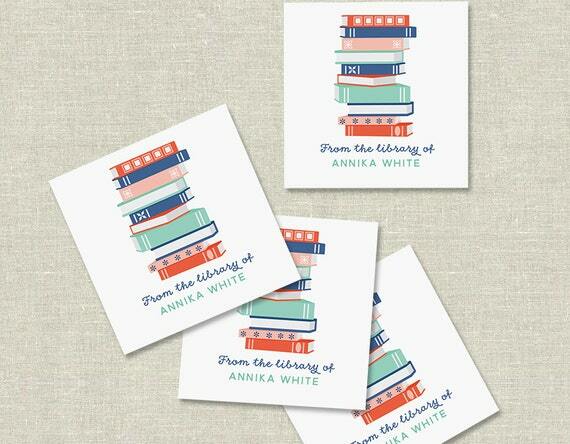 She does all kinds of bookish artwork and paraphernalia, including book sleeves, mug rugs, blankets, t-shirts, tote bags, and much more. I also second the Carrot Top Paper Shop recommendation –lovely mugs and artwork! Other favorite bookish Etsy shops include Lucy in the Sky Creations and Sweetpages. I love these ideas! I bought myself a Kate Spade IPhone case that is for book lovers. You might want to check it out. It is a picture of books on a shelf. What I want for Christmas is Louise Penny’s entire Inspector Gamache series. Love Three Pines and all the characters. ???? That series is one of my top 5! Love how philosophical Gamache is. Love the suggestions! Just ordered 2 book weights and a bookmark for Christmas gifts. Thanks Anne! I ordered a booksleeve from Kari after Anne shared a picture of her sleeve earlier this Fall and I LOVE it. Kari is super quick at responding to questions via Instagram, and she had my sleeve shipped to me really quickly. Reasonable price to ship to Canada too, which is always a gamble these days! Can you please provide source information for the arrows book weight in the photo “7. I’d Rather Be Reading bundle”? Thank you. It was a gift, and I love it, but don’t know where to source it. I love my Page Anchor – I bought it after seeing it in one of your previous lists and it’s brilliant! Perfect for reading whilst eating my lunch at work. Me too! I bought one for myself and one for my mom after seeing it on last year’s list. We love it! Do you ship the “I’d Rather Be reading” bundle to the UK? I’m really struggling to get a copy of the book over here. If you don’t mind emailing melissa@modernmrsdarcy.com with specifics she’ll investigate the shipping situation. Thanks! Thank you for doing these guides every year. I have a few close (but long distance) friends that I buy birthday presents for and I often go with books, but it’s nice to branch out sometimes. 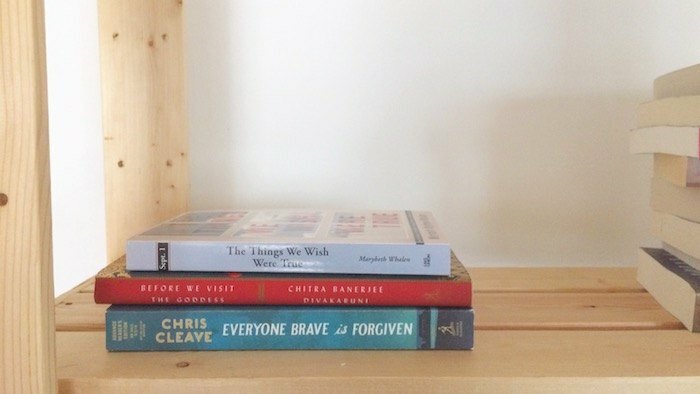 I just ordered two mugs from The Ideal Bookshelf for a friend turning 25 next week! I got all three of my kids (ages 10, 7, and 5 at the time) personalized book stamps last year for Christmas, and they were a huge hit! They were as excited about them as any gift they received. I just came across this site, so I don’t have personal experience with them (yet!) but these look amazing. ? There are so many great shops to get book sleeves from on Etsy…Baby My Book, SewFeathers, Live the Cozy Life. I also adore Sweet Sequels on Etsy for all things bookish. 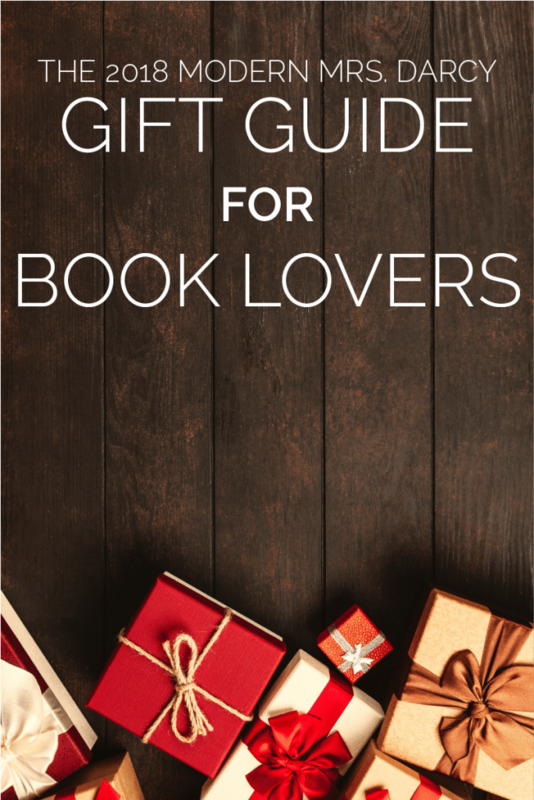 These are great gift ideas for book lovers! Thank you for sharing. It’s always tough finding a reading themed gift for my friends and family, so this is helpful. I also stumbled across these unique watercolor art gifts for book lovers that were created by a local artist in Northern Michigan. She makes mini desk calendars with reading inspired quotes. Really cool! I thought it was worth sharing and hope you appreciate it too. not shy about lying along with other people. There is no doubt that Russian dating sites are widely successful globally. I’m off to look up the Bishop’s book.